I'm a natural night owl with a traditional office job. These are two things that don't go well together, even after a decade of trying. The other problem with an office job is that people are quick to drink all the coffee from the percolating machines without starting a new batch. Last year, I got this French Press as a birthday gift from a friend and it changed the game. With this French Press, I was able to start brewing some decent coffee while working in an office setting - without having to share it with everyone else. The office coffee machine dispenses boiling water which is absolutely perfect. At this point, I now have two - one for the office, one for home. And for home, I pair it with a coffee grinder and an electric kettle. My favorite part of the French Press is that I'm able to make a lighter coffee or a blend darker than the far side of the moon. I can even do both on the same brew - drink one cup sooner and let the rest brew longer. It also works really well with making a cold brew. Overall, this is a simple brewing method with great results. 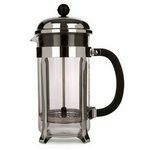 Wonderful French press at a great price! I literally threw my coffee pot away after purchasing this French press. It is very easy to use and easy to clean. You can take the plunger apart to make sure that is is cleaned well and it dries easy. You can adjust your own coffee strength by varying the amount of time you let the grinds sit in the water which is great! I love strong coffee so I can use less coffee but let it sit longer in the water before straining to get a full bodied coffee at a better value than using my old coffee machine. This is a must buy for any coffee lover! 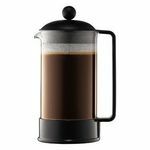 The Bodum Brazil 8-Cup French Press Coffee Maker is a very simple machine that does a good job of producing coffee, but it's far from perfect. I load the glass container with coffee grounds and pour hot water into it. I take a spoon and stir the grounds around for about 20 seconds and place the lid on the container. I then push the plunger apparatus down and it strains the coffee grounds. It does a good job of extracting the natural essences from the coffee grounds. The coffee has an adequate taste, but it's not on par with my automatic coffee maker. The coffee produced is usually smooth, but it's a little on the weak side. On more than one occasion I have ended up with gritty coffee despite following the same routine. The main issue I have with this coffee maker is that it leaves behind a lot of residue at the bottom of the glass. If I don't clean it within a hour it can become a chore. I wouldn't recommend the Bodum Brazil French Press Coffee Maker as a primary coffee maker, but it's an adequate backup. 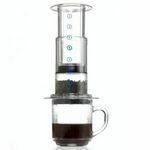 Perfect coffee press for cold brew coffee! After the glass broke on my first bodum coffee press, I finally purchased a new one to start brewing cold brew coffee. So far, the bodum french presses have done a good job for me. When I have brewed hot coffee, the ability to let it brew for as long as it needs for a stronger flavor without having to use extra coffee grounds is a high point for me. Since I'm the only one in my household that likes pressed coffee and this summer I've had a craving for cold coffee drinks, my new press has been used only for cold brew, and I've been very happy with the results! I let it sit for 24-48 hours, stirring a couple of times, and then filtering it a couple times when done, it's the perfect strong brew for a much-needed summer afternoon eye opener. Cleaning the unit seems to be easier than when my old one, even though the design was pretty much the same. This style of bodum press is pretty easy to disassemble to clean the entire unit. 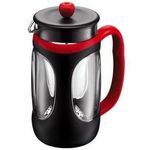 I love the Bodum original french press because of its design, durability, and price. The Bodum design is very simple but modern looking. It makes for easy use of the device and easy cleaning when done. The press with its mesh screen allows you to press coffee grinds or tea leaves for your preference. It holds the loose bits down so that none escape into your mug when you pour. This model comes complete with plastic handle, lid and bottom to prevent heat transfer. The sleek design looks good in any kitchen! The Bodum french press is very durable. I have not seen a problem with it in years, and even then, some Bodum french presses have the option to replace certain parts instead of the whole thing (i.e. the glass can be replaced). I think that the price for this Bodum is a great deal. I've purchased Bodums many times (as gifts) from different places and they are all listed for the same price, which I find convenient. There is no worry about getting the best deal. I feel that this model, with plastic pieces in stead of metal, offer a still sleek but more cost effective option to other models. So although this one does not have replaceable parts, it is inexpensive enough to replace completely. Product works well but you must buy coarse ground or whole beans and grind them yourself because the mesh screen lets through powdery grit. The molding around the glass container is plastic, it seems durable but is flexible and comes away from the glass. I put it in the microwave for like 4 minutes and then let it stand for around 6 minutes on average depending on the type of coffee. What can I say - I use my Bodum French Press EVERYDAY! My parents got us using the Bodum French Press when we starting complaining about our lack of counter space for the coffee maker. We have a very small kitchen with very little counter space, because of this, I had given up the use of my coffee maker since there was nowhere to put it. When my parents came to visit, they could not be without their coffee. My mom brought her Bodum French Press with her to make sure that she had her coffee. After the first cup of coffee with the Bodum French Press I was sold. Not only was it easy to use, it made one great cup of coffee. I simply heat the water electric kettle, pour over the coffee in the Bodum French Press and in three minutes I have a cup of coffee. I only drink one cup in the morning, so this saves me from having to make a full pot and is so much easier to clean up. The best part is that I have been using the same one for the last three years without any issue. A great quality french press! You see coffees being described like a fine wine. Having citrus notes, or a full body, sometimes a crisp finish. You think, "Who come's up with that???" Using a regular coffee maker with a filter traps all these flavors/notes so they're not released into the coffee. A french press coffee maker allows all those qualities to remain in your cup. I really enjoy using my Brazil Bodum French Press Coffee Maker for this exact reason. I was given the opportunity to do a side by side taste test of my favorite coffee. One cup was through the regular coffee maker, the other was done with the Bodum French Press. With the regular coffee brewer, all the sweet hints of my favorite dessert coffee were completely nonexistent! 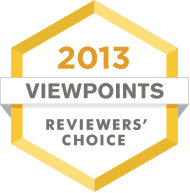 That was the moment I was forever devoted to my Coffee Press. I had picked this model up at a local kitchenware store and love the quality. Bodum creates very sturdy coffee presses. Brew Performance No grounds in your coffee! Ease of Cleaning Top rack dishwasher if necessary. I hand wash mine and it takes but a minute. An excellent way to make the perfect cup of coffee! The Bodum Brazil 34-oz. 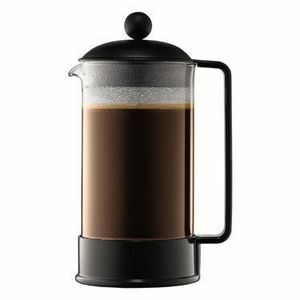 French Press coffee maker is such an easy, affordable way to make the perfect cup of coffee! I have been using one for about four years now, and I will never go back to traditional drip coffee makers. I love the fresh, rich taste of french press coffee, and the Bodum Brazil 34-oz. 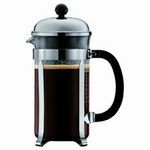 French Press coffee maker is extremely affordable and durable. Give it a try! Perfect coffee and tea every time! I love my Bodum French Press. It' simple to use, easy to clean and built of strong sturdy materials that will last forever with proper care. This product is nearly perfect. It's great for hot or cold brewing and works just as well for tea or herb infused broths as for coffee. It's a great size for three people to have a standard 8oz cup or for two people to have a large cup. It's easy to hold and transport and very easy to keep clean. I especially like that none of the internal parts are plastic, which can warp, stain and hold on to flavors. All internal parts are glass or metal so you get a nice clean flavor. And you'll never need filters again which is not only convenient but frugal. If I had one complaint it's that I wish I could disassemble the plastic base from the glass for easier cleaning. Occasionally small particles (like tea leaves and coffee grinds) end up stuck between the plastic base and glass carafe. If there was an easy (safe) way to remove the plastic to clean the base this would be a perfect product.